Books of Magic #3 Review – AiPT! Tom Fowler’s art is on full display in Books of Magic. Books of Magic #3 is another ingredient to a finely crafted mythical spell. Thus far the series has stayed true to past iterations of the titular title while forging a new, compelling path of its own. With each new entry, the mysteries in the world of magic surrounding Tim grows ever more interesting. 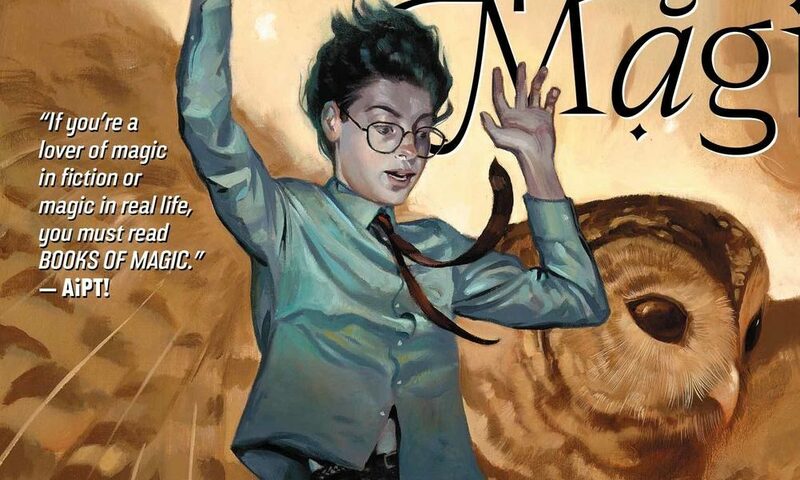 Teen angst, occult conspiracies, and murder make each new issue of Books of Magic a must read. The running theme in Books of Magic #3 is death and the consequences of our actions. Destined to become the world’s greatest magician, Tim’s power grows with each attempt, but if navigating the perils of high school isn’t enough, a shadowy clan seeks Tim’s death. Meanwhile, Tim’s teacher, Mr. Brisby has been found dead in a gruesome crime scene. The school mourns the loss of Mr. Brisby while Tim struggles with the responsibility his newfound abilities presents. Tim seeks to reap the benefits of the commanding magic at his fingertips, namely in finding his long-lost mother. Unfortunately, the young magic-user is still a novice in his power, and inadvertently killed a group of attackers in a raw display of magic. Tim must now come to terms with the blood on his hands and accept or reject the dark prophecy approaching. Books of Magic is a fast read, but this is based on how engulfed readers will become in the story. Once you reach the final page, you find yourself longing to witness what comes next. First and foremost, obvious comparisons will be made to Harry Potter — expel rote evaluations like this from your mind. Books of Magic is much darker in its execution and uniquely nuanced; every action has repercussions that resonate throughout the book. Tim’s growing obsession with his mother has already resulted in casualties, and more death is expected. Case in point: Tim struggles with his murderous actions. Writer Kat Howard lends gravitas to the decisions Tim — and the supporting characters — make. Tim can’t sleep, his mind continually plays back the harrowing memory, and he voices his growing concern; Artist Tom Fowler supports the mental anguish in his work. Tim looks more disheveled over time; his appearance is a physical representation of his deteriorating mental state. Despite how many comics are released yearly, it is still a thing to behold when a writer and artist come together so seamlessly to allow their respective talents to form something more significant than the sum of its parts. Kat Howard also does the book justice by building on the mystery; toeing the line between excessive revelations and hoarding clues. Just enough is provided to readers to reveal another bit of information to keep us engaged. Very little is known of the Illuminati-like group concerned with Tim’s oracular divination, but each issue brings us one step closer to the answer while never feeling frustrated in the lack of details. Three (presumed) witches watch over Tim in a cauldron that sees all, including his mass murder. Not enough is known about their end-game, but we know they are concerned with how quickly Tim’s power grows, and the dangerous implications of his continued development in magic. Then there’s Dr. Rose, Tim’s would-be guide into the world of the occult and a professor at his school. It remains unclear what her true intentions are, but her connection to the death of Mr. Brisby does not remain in doubt. In past issues, she handily killed an assassin stalking Tim but has yet to reveal the incident or the foretelling she saw in the corpse’s blood. Yes, Dr. Rose spilled the assassin’s blood across the city street to read it as one would with tea leaves — glean what you will from that. Once again, Books of Magic is a dark tale (in a good way). The duality of Dr. Rose is interesting. She shows signs of concern for Tim’s well-being but has more at stake in his ties to magic rather than his personal life. It will be interesting to see how the relationship plays out. Tom Fowler’s art is on full display in Books of Magic. His heavy line-work, expressive characters, and diverse use of perspective unsurprisingly immerse readers into the story. Look no further than pages 11 and 12 of Books of Magic #3. It runs the spectrum of human emotion: concern, mourning, and support. Tears stream from Ellie’s eyes as she vents to Tim over Mr. Brisby’s murder. Tim finds a silver lining to lift her spirits. As Ellie wipes away a tear from her cheek, the two are left in thoughtful silence. With a story that weighs heavily on human emotion, Tom Howard’s work feels like a natural fit. Plenty of comics are striving for readers attention, but Books of Magic #3 stands out among them. If you’re looking for a comic outside of the standard superhero genre, Books of Magic has it all. Magic, mystery, and sincere character work makes Books of Magic a must-read. Give Tim’s tale of death and consequences a chance and you will not be disappointed.